The date entry portion is well defined and it makes perfect sense to have a calendar pop up so you can pick a date from a rich UI when necessary. However, time values are much less obvious when it comes to displaying a UI or even just making time entries more useful. There are a slew of time picker controls available but other than adding some visual glitz, they are not really making time entry any easier. Part of the reason for this is that time entry is usually pretty simple. Clicking on a dropdown of any sort and selecting a value from a long scrolling list tends to take more user interaction than just typing 5 characters (7 if am/pm is used). The keys loosely follow the ancient Quicken convention of using the first and last letters of what you're increasing decreasing (ie. H to decrease, R to increase hours and + and - for the base unit or minutes here). All navigation happens via the keystrokes shown above, so it's all non-visual, which I think is the most efficient way to deal with dates. Note the title which might be useful to alert people using the field that additional functionality is available. You essentially tie the plugin to any text box control. You can pass in a format string that allows you to format the date. 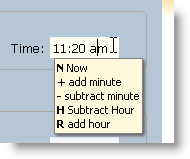 The default is "hh:mm t" which is US time format that shows a 12 hour clock with am/pm. Alternately you can pass in "HH:mm" which uses 24 hour time. HH, hh, mm and t are translated in the format string - you can arrange the format as you see fit. You can also specify a callback function that is called when the date value has been set. This allows you to either re-format the date or perform post processing (such as displaying highlight if it's after a certain hour for example). The plugin code itself is fairly simple. It hooks the keydown event and checks for the various keys that affect time navigation which is straight forward. The bulk of the code however deals with parsing the time value and formatting the output using a Time class that implements parsing, formatting and time navigation methods. /// adds minutes to the internally stored time value. /// adds hours the internally stored time value. The plugin consists of the actual plugin and the Time class which handles parsing and formatting of the time value via the .parse() and .toString() methods. Code like this always ends up taking up more effort than the actual logic unfortunately. There are libraries out there that can handle this like datejs or even ww.jquery.js (which is what I use) but to keep the code self contained for this post the plugin doesn't rely on external code. There's one optional exception: The code as is has one dependency on ww.jquery.js for the tooltip plugin that provides the small popup for all the hotkeys available. You can replace that code with some other mechanism to display hotkeys or simply remove it since that behavior is optional. Although date entry tends to be much better served with drop down calendars to pick dates from, often it's also easier to pick dates using a few simple hotkeys. Navigation that uses + - for days and M and H for MontH navigation, Y and R for YeaR navigation are a quick way to enter dates without having to resort to using a mouse and clicking around to what you want to find. Note that this plugin does have a dependency on ww.jquery.js for the date formatting functionality. The logic for this plugin is similar to the timeKeys plugin, but it's a little simpler as it tries to directly parse the date value from a string via new Date(inputString). As mentioned it also uses a helper function from ww.jquery.js to format dates which removes the logic to perform date formatting manually which again reduces the size of the code. I've been using both of these plugins in combination with the jQuery UI datepicker for datetime values and I've found that I rarely actually pop up the date picker any more. It's just so much more efficient to use the hotkeys to navigate dates. It's still nice to have the picker around though - it provides the expected behavior for date entry. For time values however I can't justify the UI overhead of a picker that doesn't make it any easier to pick a time. Most people know how to type in a time value and if they want shortcuts keystrokes easily beat out any pop up UI. Hopefully you'll find this as useful as I have found it for my code. I like the concept (and I typically always use the jQuery UI DatePicker in my apps) but my only suggestion would be making your hotkeys only require a single keystroke. Everything is laid out nicely until I have to add a minute (+) at which point I have to press two keys. If you're going for typist-efficiency, I'd suggest you use the arrow keys (up=add minute, down=remove miunute, left=remove hour, right=add hour) and that way it can be intuitively entered at lightning speed with a single hand. Just a thought. @Usualdosage - Hmmm... yes I like that idea! 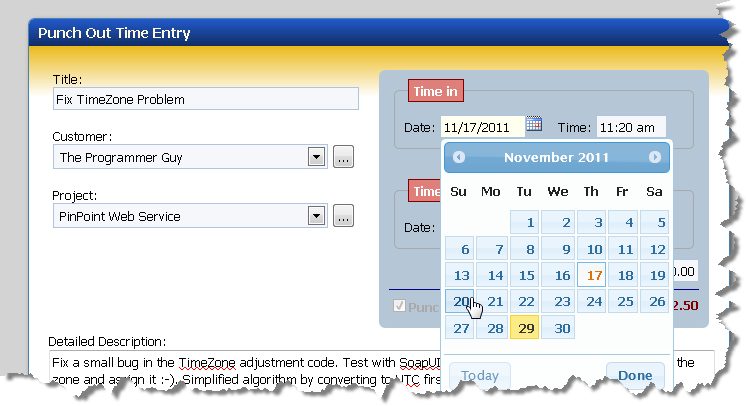 :-) I was trying to stick with an old convention of how Quicken does date entry, which is easy to remember. With the up down, left right you're going to have to remember which is which. I think it might be nice to allow keystroke specification (or keycode). Usualdosage, note that '=' is considered a synonym for '+'. Pressing Shift is optional. Cool. But if you're going to show that tooltip anyhow... why not make it an actual menu, displayed in the manner of an auto-complete menu (even though it's not), and then people on touch devices can use it simply by touching, without bringing up the keyboard to enter a time OR to activate the navigation keys. Folks on touch always want entirely keyless entry if possible -- and you're one step away from making it so, for some times anyway, or if they really want to. While easy to add, your code for the date is missing (as posted in the blog entry..not sure about the download) the handling "Y" and "R" for adjusting the year. Nice post. In the past I have done a couple of different things with my time pickers you might find useful. First ditto to the arrow keys suggestion by @Usualdosage. Also, typically time picker controls are used in business applications and users aren't concerned generally with 3:02 PM vs 3:03 PM. Rather 5 or 15 minute increments are sufficient. So rather than having the control inc/dec by 1, it is a much better experience to inc/dec by 5 or 15 minute increments. Lastly, if you allow a period (in addition to a colon) to separate a time entry, then the user can quickly enter the information via their numeric keypad (ie. 8.30 becomes 8:30 AM, 13.30 becomes 1:30 PM). I was trying to see the inline help. Kept pressing ?, but it kept writing ?. Until I figured that you used the English keyboard layout. Good work though. But you need internationalization. Well, great idea and great execution. But in datepicker control, Y and R keys are not working. I was able to type the keys but rest of the keys worked like charm. I wish I could upload the screenshot. Note : I was checking the demo in Google chrome. @all - Many great thoughts. I fixed the Y and R both in the sample and in the download. This is actually some old code and I didn't notice that Y/R was missing. @Pierre - Hmmm... I would have thought that ? is always the same keycode (or /) I suppose. This goes back to the previous issue. Keycode detection would be a lot easier if we could check the actual character that was input rather than just the keycode. AFAIK, there's no consistent cross browser way to get the character value from the keycode + shift state alone across browser. keydown works for some but not all browsers. I'll make a few revisions to implement default with arrow keys and supporting . in addition to : syntax. The problem with arrow keys time/date navigation is that hooking hotkeys to them interferes with regular navigation of text input. If you're just typing in or editing a time value the left and right keys are pretty crucial in entry. Played around with arrow navigation for a minute and it just didn't feel right if you also allow editing of the field. Nice thought on alternative input possibilities. Using your demo in FireFox 8.0 pressing Y / R, subtracts / adds to months as well. @Marcus - Thanks, updated code in article and the download. Should be fine now. I'm now working at a place that does a lot of time-based queries. Would it be hard to modify this to set seconds too? Would you have to do it with another key for the seconds, like Ctrl-Up/Down?